If I had a picture for every delicious thing I’ve eaten over the last month, this entry would probably go on for about five pages. There have been many, many good things. But unfortunately some of them got saved on my mom’s laptop, and when I tried to apply the pictures to Blogger (GRRR), it wouldn’t let me. So, here are just a few samplings. This looks ugly, but trust me, it’s absolutely delicious. It’s one of my favorite pre-workout snacks (I know, I have a ton of granola bars, but sometimes I don’t feel like having one of those). 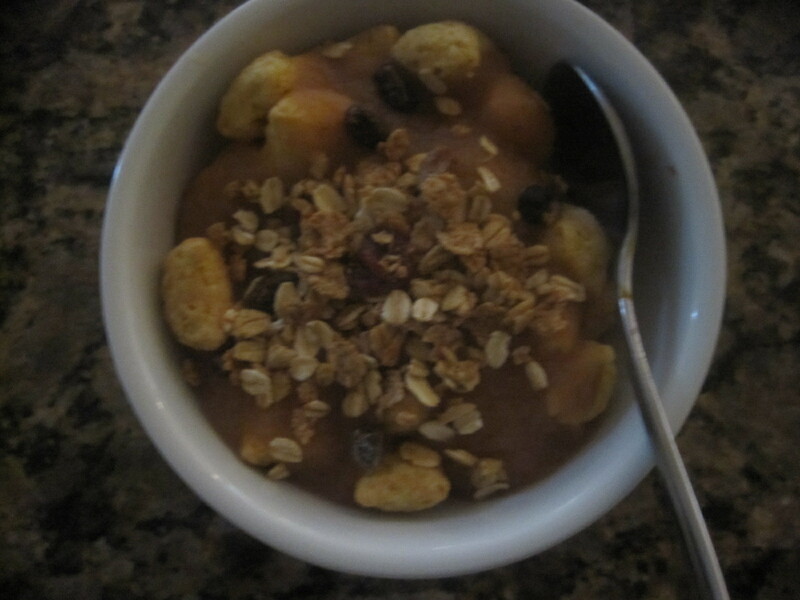 This is about a serving of Peanut Butter Puffins, together with a tablespoon or so of granola and 1/2 cup applesauce. It gives me carbs and sugar in a hurry. That’s the vegan cornbread I made a few weeks ago. There’s still some left, so I froze it and enjoyed some last week with three eggs over medium and a few roasted brussels sprouts. 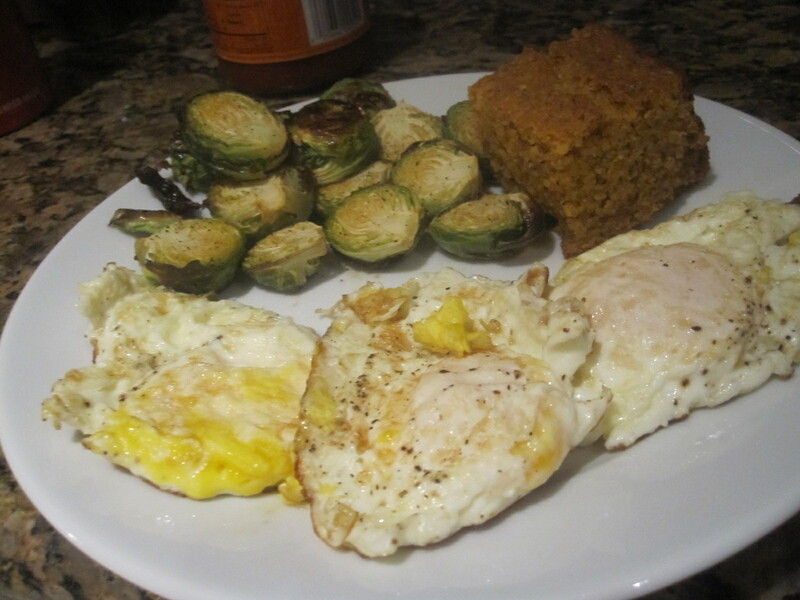 After I took this picture I covered the eggs with peach salsa and the brussels sprouts with ketchup. And this is what I’ve been having for breakfast every. Single. Day. 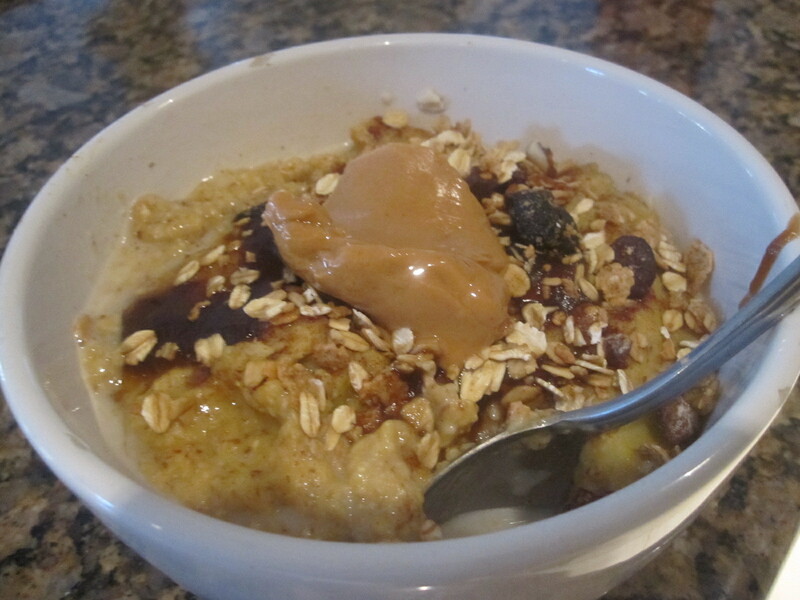 Oat bran, 1/2 apple or pear, granola, raisins, Skippy’s Natural Peanut Butter, and jam (or caramel apple butter, in this case). Absolutely amazing and filling! 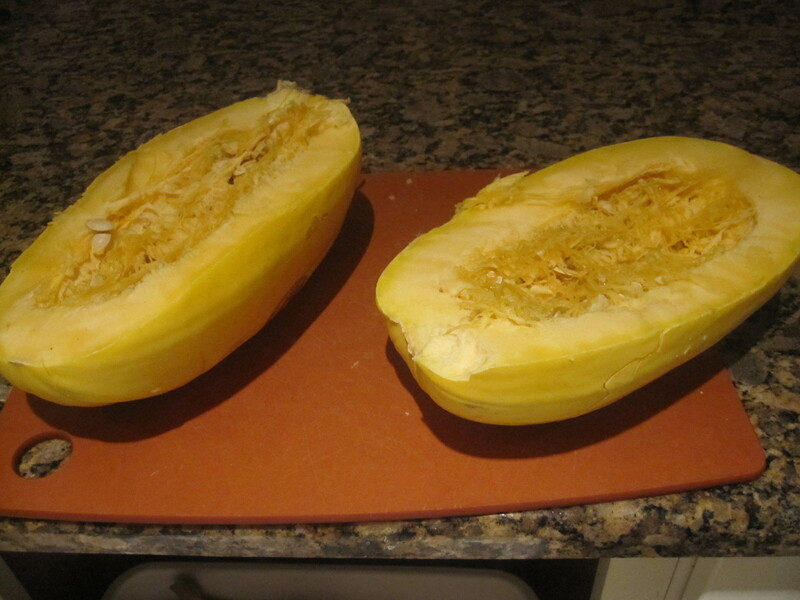 And I was quite proud of myself for this one…this spaghetti squash was about the size of my upper body. I heated it through in the microwave and very slowly (and very carefully) sliced it open. 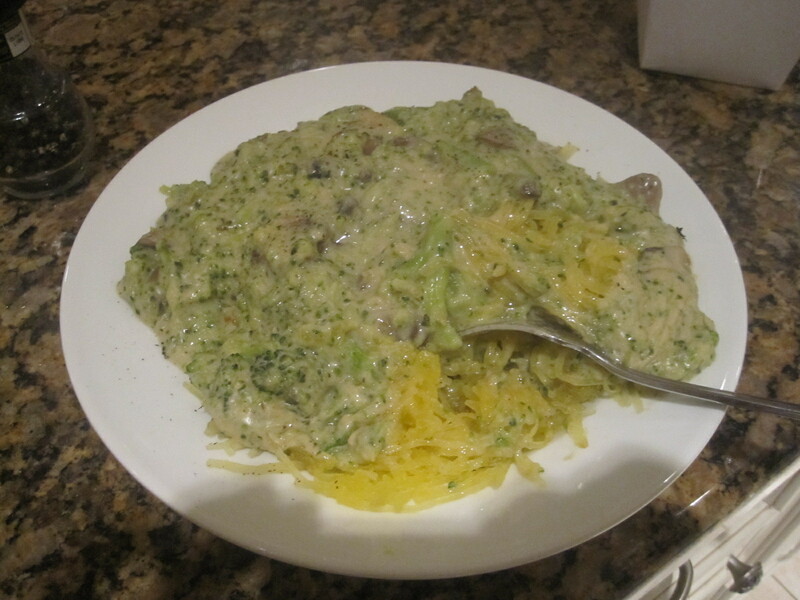 I then roasted it for about 40 minutes, then scraped out the ‘noodles’ and made a vegan cream sauce with mushrooms and broccoli. I found the recipe via The Front Burner. Absolutely delicious. It’s kind of gross, what I did with this sandwich. 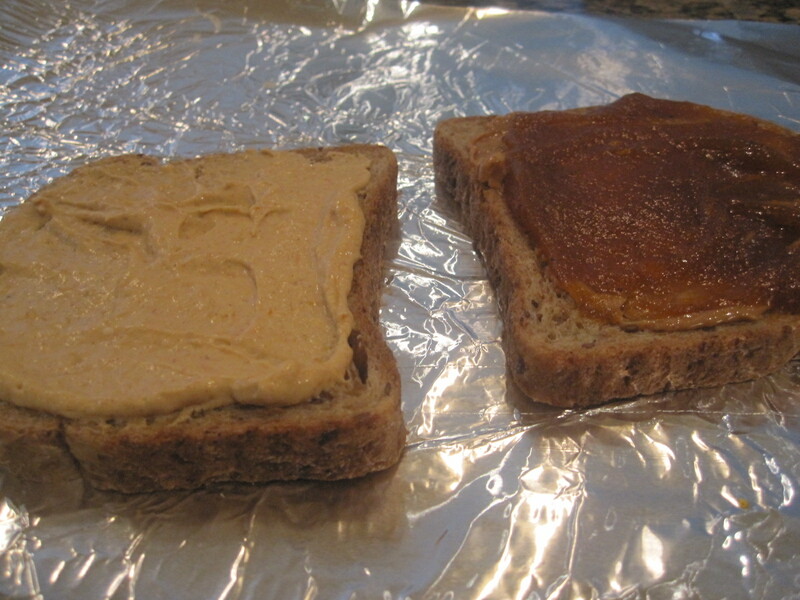 On one slice: Pumpkin Butter and peanut butter. On the other side? Pumpkin Cream Cheese from TJ’s. Yeah. It was absolutely delicious, though I did seriously crave broccoli afterwards. Or a shot of insulin. 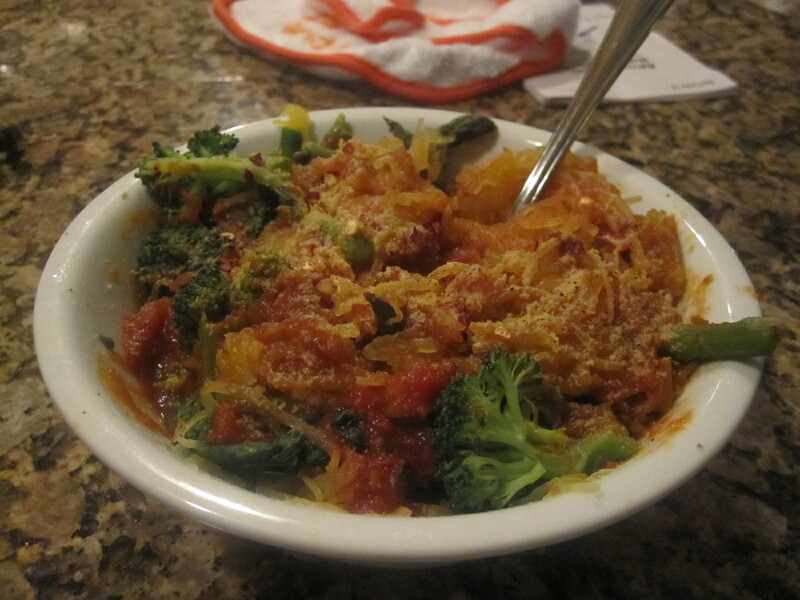 And another go at the spaghetti squash, this time with asparagus, broccoli, spicy fra diavolo sauce and I believe tofu. 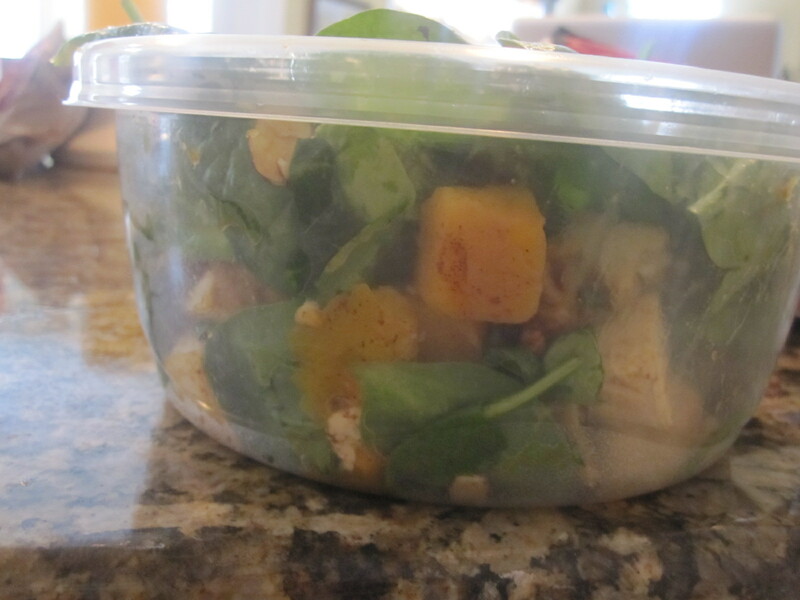 Using up the rest of the tofu…I roasted a cup of butternut squash, red onion, brussels sprouts, and the tofu in the oven for about 30 minutes, then added some chopped dried figs on a bed of romaine and spinach. A great, filling salad. This was pretty incredible. 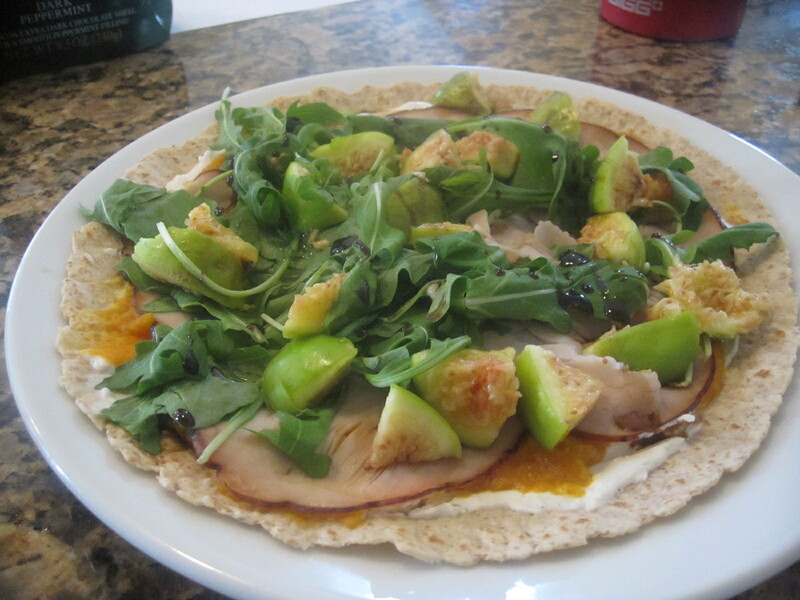 Fig and turkey and arugula on a tortilla with canned pumpkin and goat cheese. I know, it sounds disgusting. DON’T BE AFRAID. Other than that? Lots of oatmeal. And broccoli. And fruit. And pineapple quince. Now off to get a workout in, and off to work!! !